Daniel Ruggles (1810-97), Brigadier General, CSA (MA). Participated at Corinth, Shiloh, CSA Commisary General of POW. 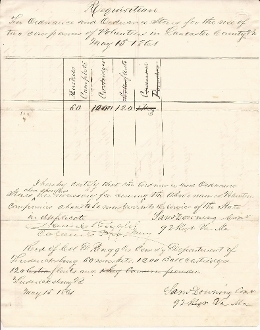 Document Signed (DS), 2 pages, 4to., Fredericksburg, VA 5/15/61 requisition for arms and ordinance store for the use of 2 companies of Volunteers in Lancaster Co., VA. Signed by the Commander of the 92nd Regt. Virginia Militia, and by Ruggles as Colonel Provisional Army. "...60 muskets; 1200 ball cartridges; 120 flints..."
Reinforced edge splits, otherwise fine. The glossy photo of Ruggles included.